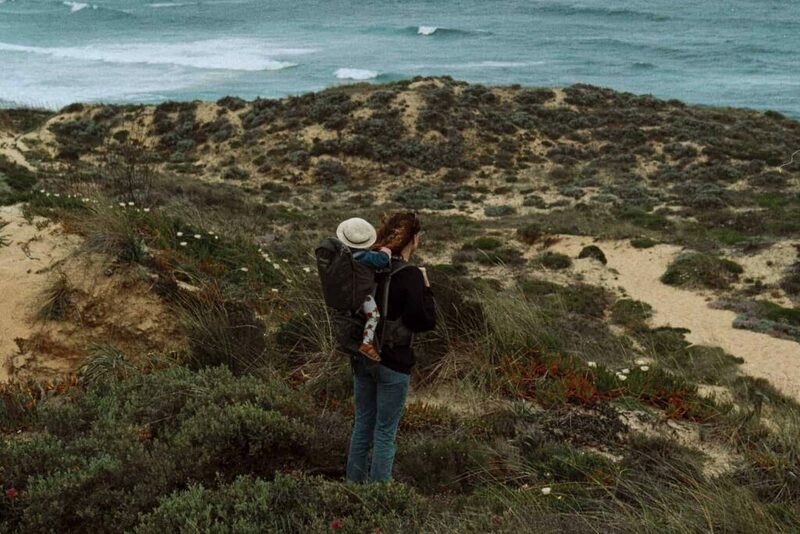 The Best Baby Carrier for Travel - What Baby Carrier is Best in 2019?The Best Baby Carrier for Travel - What Baby Carrier is Best in 2019? When deciding what baby carrier is best for you and your baby, there are so many things to take into account. But when you want to find the best baby carrier for travel – there are even more things to consider! Whether you’re an experienced baby wearer or not, making the decision to baby wear on holiday is an excellent one. Ever since my son was born (almost 6 years ago) my husband and I have been wearing him – both at home and around the world. Between us, we’ve tried a multitude of baby carriers over that time – everything from wrap baby carriers through to backpack baby carriers for hiking trips. I’ve put together this guide to help you choose the best baby carrier for your needs. 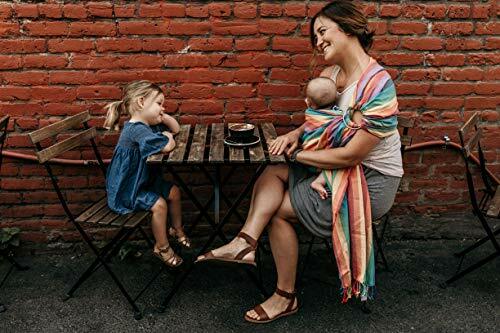 If you’re a complete beginner to babywearing, I’ve got you covered with information about all the best baby carrier brands on the market, and what each is good for. 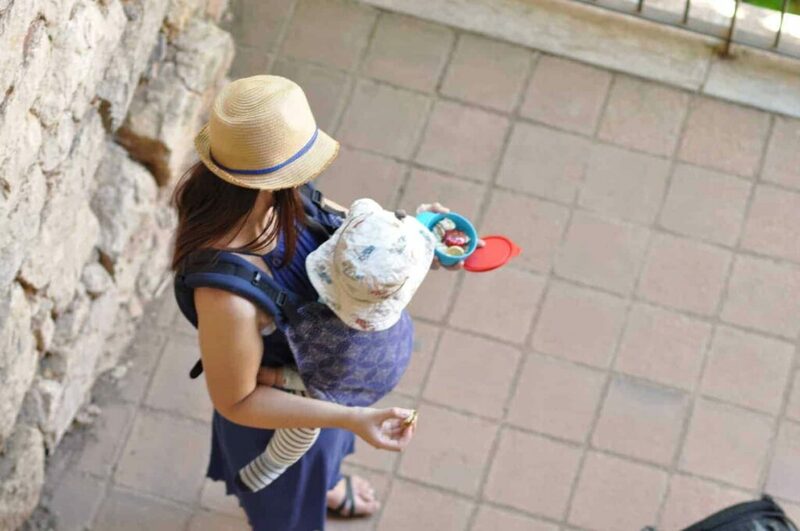 If you’re already babywearing and you’re simply looking for the best travel baby carrier, then you can skip ahead to the comparison table and reviews! The decision to use a baby carrier vs stroller for travelling is one that many parents grapple with. Of course, sometimes it’s easier to take a baby carrier and stroller with you when you travel, but it’s not always practical. And who wants to lug around extra luggage if you don’t need to? I’m not going to go into all of the benefits of babywearing, but let’s look at some of the obvious and not-so-obvious benefits when using a baby carrier for travel. Keeping tabs on toddlers. Who wants to be chasing after toddlers in a busy airport? 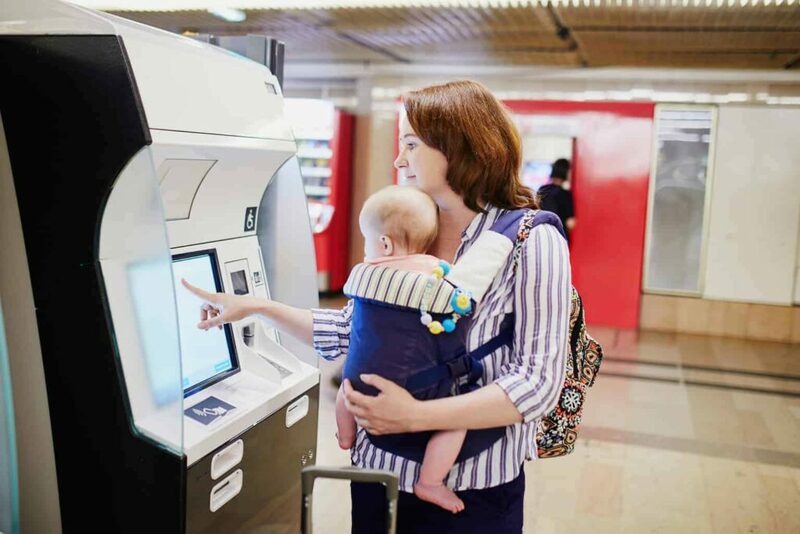 Using a baby carrier is an excellent way to be able to keep an eye on toddlers and pre-schoolers while checking in and navigating your way through the airport. Allowing babies to sleep through security. If your flight is at a time when your baby normally sleeps, having them in a baby carrier allows them to continue sleeping while you go through the checking-in and security screening process. At some airports, you’ll be required to remove the baby carrier to go through security, but not always. It’s still a better option than having to pick them up out of their stroller – which is guaranteed to wake most babies up! Having hands free for luggage. Ever tried to push a loaded luggage cart and a stroller at the same time? Trust me, you’ll want to give this one a miss. Especially if you’re travelling without another adult’s help. It’s just a godsend on the plane. Travelling with young babies can be challenging. Our son wasn’t falling asleep on his own when we went on our first big overseas adventure with him. Using the baby carrier made it easier to rock him to sleep, either standing in the aisle or simply walking up and down – without my arms going numb from the exertion! Once asleep it was far easier to transfer him into the bassinet, or sit down and let him snooze on my front while using the baby carrier. It’s light and easy to transport. It goes without saying that a baby carrier is easier to transport than a stroller, and if you’re wearing it – it won’t even count as part of your luggage allowance! Strollers can’t cope with cobbled lanes. 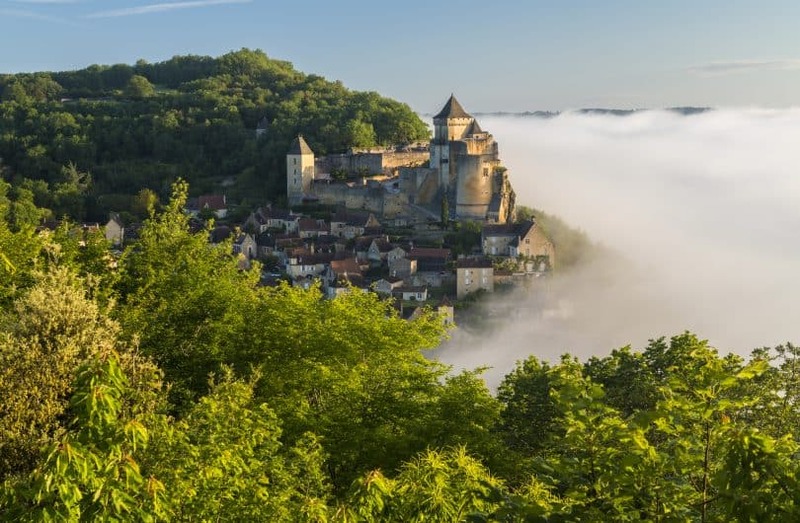 The first time we travelled to Europe with our son I also brought along our shiny new Bugaboo stroller – and then found it was more of a nuisance than anything else! The haphazard nature of European streets adds to their charm, but cobbled lanes, narrow paths, high curbs, and uneven roads are not suitable for strollers. Save space on public transport. If you’ve ever tried to get on a packed subway/metro train with a stroller, you’ll most likely not want to repeat the experience! Sightsee with ease. Yes, you can take your stroller up the Eiffel Tower in Paris, or into the Museum of Natural History in New York, but you’ll be fighting the crowds and will find you can get around better without! Toddlers won’t be happy not being able to see over all the people or rails, and you’ll end up hoisting them up to get a better look anyway. 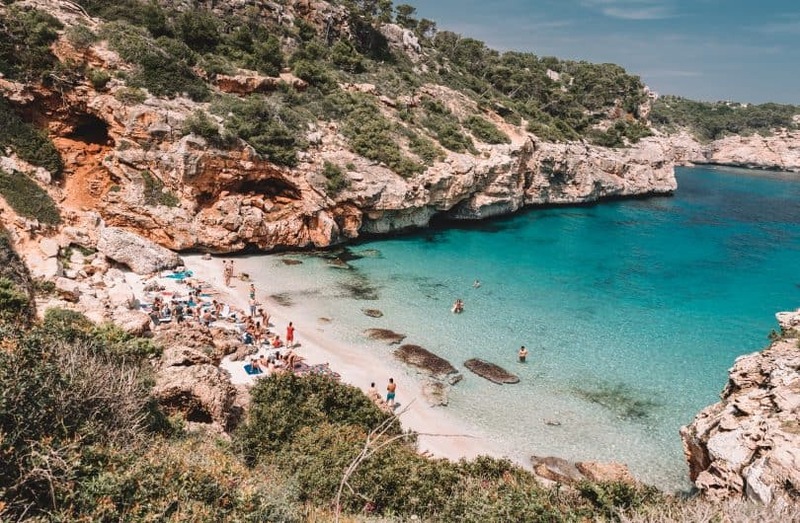 Needless to say, there have been countless attractions we’ve visited throughout Europe that would have simply been impossible with a stroller – and there’s often nowhere secure to store one either. Make shopping simple. Not all shopping aisles are made equal and you may be in for trouble trying to navigate a bulky stroller in certain shops. If you want to jump straight in to see which is the best-rated baby carrier for travel, this comparison chart is for you! Choosing the best baby carrier for travel isn’t a lot different from choosing a baby carrier for home. Some things to take into consideration include who will be wearing the baby (or toddler), how often it’ll be used, whether you want to back or front carry, and maybe whether looks or practicality are more important to you! But apart from all else, safety and comfort should be key to your decision making when choosing the best baby carrier. Babywearing safety is paramount. When you’re entrusting a piece of fabric to hold the weight of your child, it’s vital to make sure the baby carrier is up to the job. Here are a few things you should be aware of in order to wear your baby safely. Always respect weight limits of carriers. These are the weight limits they’ve been tested to, and proven safe for. Make sure your baby’s airways are visible and that your baby is well supported in the baby wrap. Don’t buy cheap knock-off baby carriers. Things like stitching, buckles, and fabric quality could be compromised – with potentially harmful consequences. Ensuring you get the right fit for your child is essential. Not only for their comfort, but also for their safety. That’s why when using a wrap or sling, it’s important to seek out advice from experienced babywearers on how best to use it. Another key aspect – especially for very young children – is to ensure the correct knee/hip placement. This prevents conditions such as hip dysplasia developing from using your wrap incorrectly. Again, this is another reason soft structured carriers (SSCs) are popular, as it’s far harder to get it wrong! The more comfortable you are wearing your baby, the more often you’ll do it! Many baby carriers will allow you to comfortably carry your child right up until they’re a hefty preschooler. So think about longevity when it comes to comfort too. The best baby carrier for newborn babies may not be the best baby carrier for toddlers. Choosing the best baby carrier for your personal needs is an important step in your babywearing journey. With so many types of baby carriers on the market, it can be a minefield choosing the right one. They all have things they are good at, and things they’re not so good at. There’s no one size fits all approach to babywearing! But what’s sure, is that is soon as you find the best baby carrier for you, you’ll find life with a baby so much easier. The first baby sling, baby wraps have been around for centuries. This is the most basic form of baby carrier. 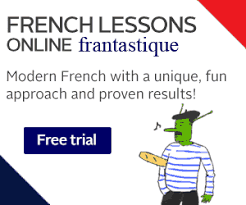 Which makes it one of the most versatile, but also one of the hardest to master! Basically just a long length of fabric, there are several carries you can do with a baby wrap. Stretchy baby wraps are one of the best baby carriers for newborns but they aren’t suitable for older babies who weigh more, and need more support. Woven wraps can be used right up until the end of your babywearing days. A good quality woven wrap can carry a preschooler! A Mei Tai is kind of a combination between a wrap and a SSC (below). 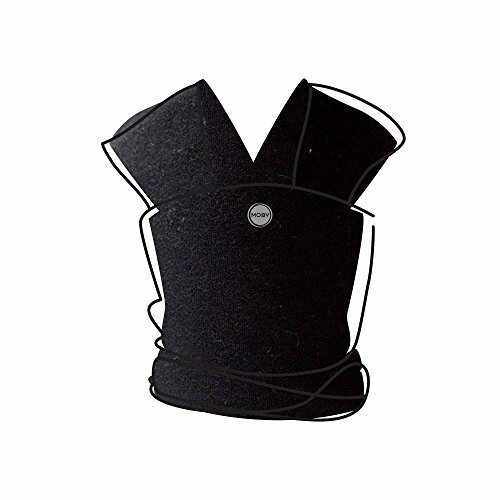 It comprises a large back panel and four long ties that wrap around your body, and that of your baby. They’re a good compromise if you’re not confident wrapping, but want a bit more flexibility with fit than the SSC will allow. Mei Tais are good for young babies, and they’re ok to breastfeed in, but not the easiest to get the hang of (see my choice of the best baby carrier for breastfeeding below). Ring slings are ideal if you love the look of baby wraps, but want something that is much quicker and easier to throw on. I used to keep mine in the car and put it on for quick dashes into the supermarket or gas station. They’re perfect for nosey toddlers, and great for hip carries. They’re also one of the most versatile carriers that’ll see you right through from newborn stage to preschoolers! The only downside to ring slings is that one shoulder is taking the burden of the weight. So they’re not super suitable for long carries. Soft structured carriers are the most popular baby carrier. They’re easy to use, they can be extremely comfortable, and some come in lightweight, breathable fabrics, making them one of the best baby carriers for summer. Many soft structured baby carriers can be worn on your front or your back, and some can even be worn on your hip. They’re also often cited as the best baby carrier for dad! Backpack baby carriers are more robust baby carriers. They have a structured framework that allows your child to sit in more of a chair position on your back. They’re not ideal for babies, but can be a good option for older toddlers and children – especially if you do a lot of hiking! Some have inbuilt rain covers, and larger pockets, making them ideal for long day hikes and getting out into the outdoors. They’re also a very popular option with dads. Never is a baby carrier more essential than when your baby is a newborn. Often referred to as the ‘4th trimester’ newborn babies take comfort in being close to mum or dad at all times. But if you’ve got other kids or other commitments, it’s not always possible to spend all day on the couch with a sleeping newborn on your lap! Baby carriers allow new mums to get on with their day while catering to the needs of your newborn. Choosing the best baby carrier for newborn babies is vital. It’s most important that your baby’s body is supported correctly, the baby wrap is the right size to safely carry your baby, and that it’s comfortable enough to wear for many hours at a time. Choosing the best baby hiking carrier is vital if you’re planning on hitting the tracks with your little one. There’s nothing worse than an uncomfortable fit, or a carrier that’s simply not up to the job when you’re in the middle of a long hike. Being able to transfer the carrier between parents is another important consideration if you’re buying a baby back carrier for hiking. Not all wraps are created equal. Stretchy wraps are awesome for young babies, but older babies will need more support. Woven wraps are fantastic for all ages and offer endless versatility, but take a little getting used to in the beginning. 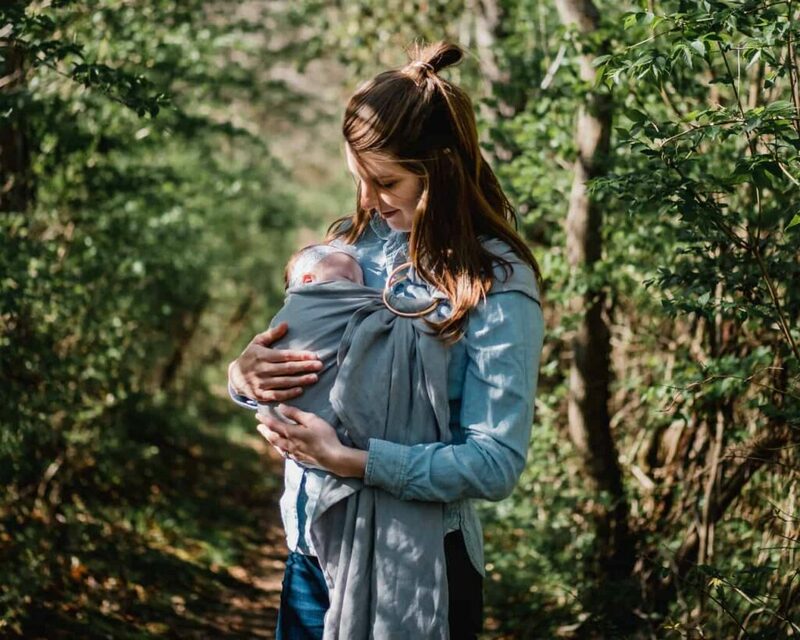 If you’re looking for the best wrap baby carrier, you’ll need to take into consideration how long you plan on babywearing, what types of carries you’re likely to do, and how much you’re willing to spend – as wraps range from very affordable, to eye-wateringly expensive! Choosing the best baby carrier for toddlers is now harder than ever with so many choices on the market! No longer are you confined to one or two choices, as more and more brands are bringing out toddler versions of their most popular baby carriers. Things to consider when buying a toddler carrier for travel include seat height and width for comfort, ease of getting your heavy toddler into it, and, conversely how easy it is for toddlers to get out. Because we all know how often busy toddlers want to get in and out of their carriers, right?! Men and women have different needs when it comes to babywearing. So if you want to find the best baby carrier for men to wear, you’ll need to look beyond what works for you. Things such as where the weight is carried, body shape (big bellies can make front carries uncomfortable! ), and extendable straps can make all the difference. In our babywearing journey, there have been some carriers that my husband loved, and others which he found incredibly uncomfortable – or at worst, unwearable. Carrying your baby on your back can be a lot more comfortable than carrying their weight on your front, and it allows you more flexibility. Things such as vacuuming, shopping, and anything else that requires bending forwards, will be a whole lot more comfortable when your baby is on your back. But not all carriers are created equal when it comes to comfortable back carries. A baby sling will be your best friend for quick trips to the shops or for calming fussy babies when it’s time to cook dinner. 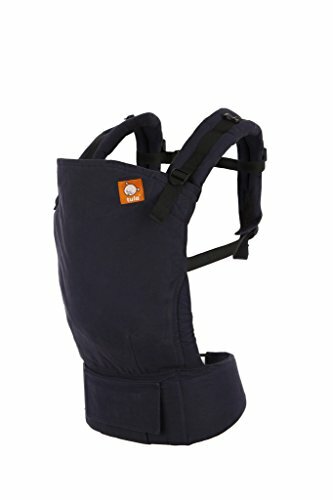 Super easy to put on (once you get the hang of it), and the best baby carrier for hip carries, a sling allows you to get on with what you’re doing while caring for your baby or toddler. Finding the best baby carrier sling is a relatively easy task. 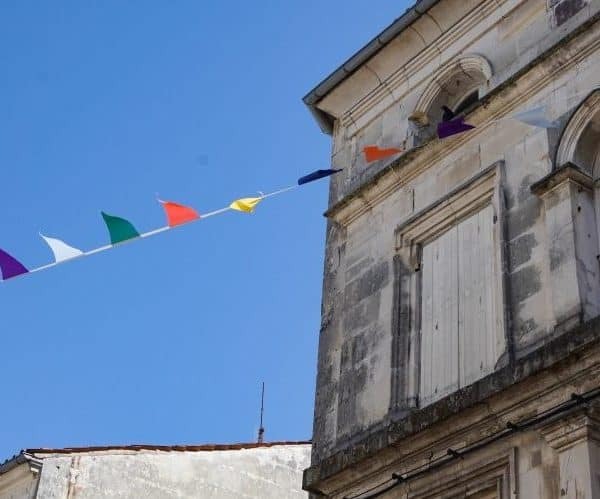 Avoid slings that don’t allow for adjustment, as they’re rarely comfortable or safe, and stick with sturdy materials such as thick woven wrap conversions and solid metal rings. If you are breastfeeding, or you’re planning to, having the ability to breastfeed your baby in a carrier is essential. You don’t want to have to get your baby out every time he or she is hungry – especially with very young babies who are hungry often! I remember once I forgot to feed my son just before walking the dogs. Halfway through our walk he got hungry and I was able to feed him on the go – handsfree and discreetly! Babywearing in extreme heat can be taxing on both you and your baby. With young babies, you have to be careful about them overheating, and older children will be uncomfortable being carried if they’re all hot and sweaty. Luckily, some baby carriers are just better for handling the hot temps, and carrier manufacturers are also cottoning on to the need for more ventilation! If you’ve been blessed with twins, you may not realise that babywearing is a very viable option for you too! Although some brands do make a baby carrier for twins, none are incredibly well designed from what I’ve seen. Instead, you’re better off DIY’ing a carrier out of the most popular baby carriers and making it work double! A long woven wrap (size 6 or 7) can be worn to carry one baby at the front, and one at the back. Or you can tie it to wear one baby on each hip. 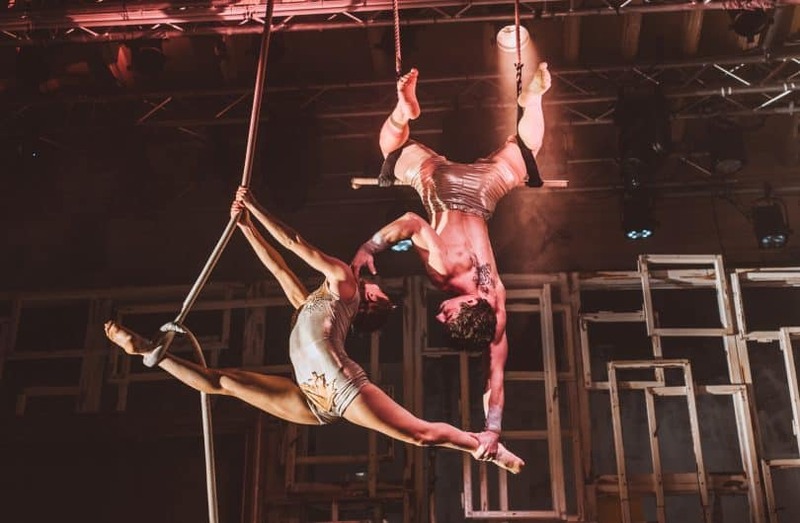 Alternatively, use two SSC’s and use one on your back and one on your front – allowing for maximum flexibility and giving you the chance to offload one to someone else when the opportunity arises! I’ve never been a massive fan of front-facing baby carriers. My son was an easily over-stimulated baby, so it would never have worked for him. Plus, there have been concerns over the earlier “crotch dangling” designs of front-facing baby carriers, and whether they were contributing to bad hip health. But I can see how they could have their place with older, more curious babies who aren’t content to peek out at the world from the safety of their parent’s chest. And designs have evolved massively in recent times to account for the aforementioned hip placement. Plus size parents needn’t worry about finding a baby carrier that will fit. There are many baby carriers on the market that will allow plus sized moms and dads to babywear comfortably – and in a range of positions. A stretchy wrap is an absolute godsend when you have a newborn that just wants to be attached to you 24/7. And the best baby wrap carrier for newborns is the Moby Baby Wrap. Made from 100% cotton, it’s breathable and flexible, so you’ll have no trouble wearing it for hours! Many parents (myself included) fall in love with the art of wrapping, and the flexibility it allows you when carrying your baby. And a stretchy wrap is often a stepping stone to a woven wrap which is more suitable for older babies and toddlers. The Moby wrap is also a perfect baby carrier for premature babies, so if your little bundle of joy were to arrive early, you’d be covered! The only downside to the Moby Wrap is that it can take a little practice to get the wrapping technique just right. The long lengths of fabric can seem quite daunting at first. But once you’ve got the hang of it, you won’t regret buying the Moby as your first baby wrap! 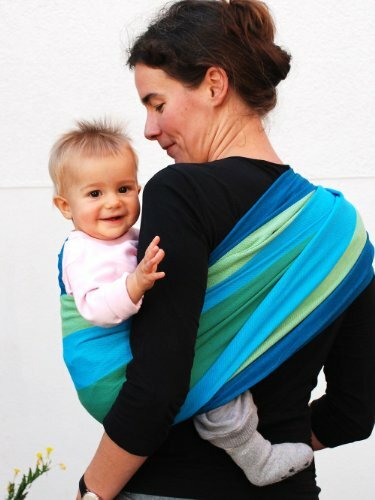 Other stretchy wraps, such as the Baby K’Tan have less fabric, but you have to choose a size – making it difficult for two parents to share a carrier. It’s easily worn by both parents, so there’s no need to pack two carriers. Machine washable and dries quickly. Breathable cotton is good for hot climates. Able to breastfeed your newborn on-the-go (and discreetly if you wish). Although some people swear by ring slings for younger babies, I most enjoyed using one once my baby was a bit older. One of the best budget baby carriers, the Hip Baby Ring Sling is a way to get a great quality carrier, at a low price. Handwoven in 100% cotton, and coloured with eco-friendly dies, the Hip Baby Ring Sling is a great looking baby carrier. And the addition of solid aluminium sling rings means it’s strong and safe for your baby too. The adjustable size of the Hip Baby Ring Sling makes it perfect for both mums, dads, and plus-size wearers – it’s the most versatile baby carrier! The Hip Baby carrier is best for short stints of sightseeing. As all of your baby’s weight is carried on one shoulder, it can become uncomfortable if worn for long periods of time. Lightweight fabric makes it easy to wear and pack. Toddlers can get in and out quickly. Older babies and toddlers can see more when carried on the hip. If you’ve decided a Mei Tai is the best baby carrier for you, then the Infantino Sash Wrap is an excellent choice. Widely regarded as one of the best cheap baby carriers on the market, this easy-to-use carrier is perfect for those who want a bit more structure, but still love the flexibility that wrap carriers offer. The Infantino is lightly padded and buckle-free, making it super comfortable for babywearers of all sizes. And while I wouldn’t recommend it for newborns, the sash ties mean it can grow with your child. The Infantino also allows you to carry your child on your hip or back – which can be a lot more comfortable as your baby gets heavier. 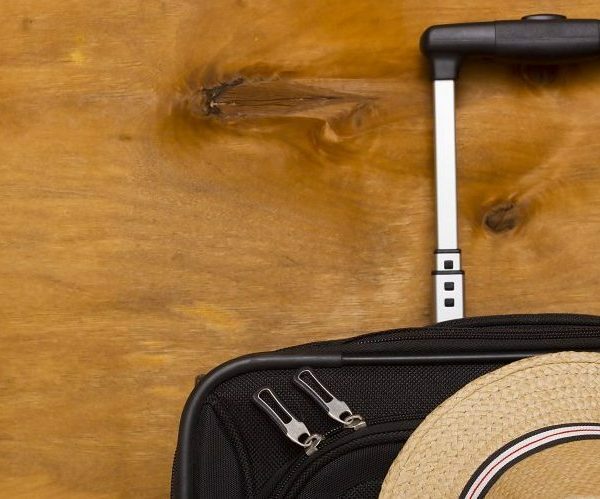 Super lightweight – at just 1.6 lbs, it’s the best carrier for international travel. Easily transfer between parents – no adjustments to be made. Detachable hood for sun protection. Soft Structured Carriers are universally loved by babywearers, and this version from Boba has some amazing features that make it stand out from the crowd. Its simple, lightweight design makes it a breeze to wear, and without having to buy an insert, your carrier will allow you to wear your baby right from newborn up into the toddler years. Known as the best baby carrier for plus size mom/dad/carers, the Boba 4G has one of the widest waist belt capacities – extending from 25-58 inches. We particularly love the foot straps for toddlers, as they give your child some grounding (and they’re less likely to kick you if their feet are firmly anchored on something!). I also love the high back of this carrier which is perfect for tall kids like mine! Easy to get on and off, so bigger kids can catch a ride when they want/need to. Comfortable to wear for hours. 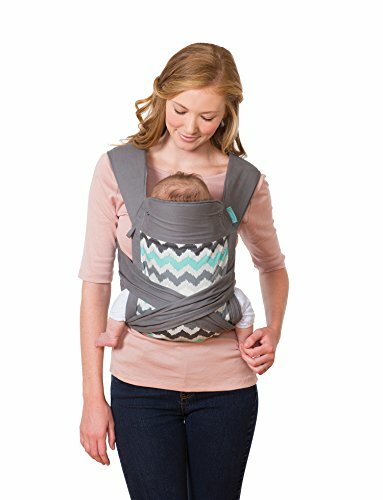 The best baby carrier wrap for older babies, Didymos have a reputation for making excellent quality wraps that function well and look fabulous! My first woven wrap was a Didymos and it cemented my love of wrapping. Of course, the biggest benefit of using a wrap carrier is the versatility it allows. So long as you buy the correct size (size 6 is generally considered a good universal size) you can master all kinds of carries! Back, front, hip, you can even carry twins comfortably with a woven wrap. Didymos woven wraps offer a lot at a very reasonable price. Making them a perfect woven wrap for beginners. Ability to carry older babies/toddlers for longer periods very comfortably. Offers a wide range of carries. Ability to carry two children at once! Discovering the Tula Baby Carrier was a game changer for my husband. He went from reluctantly carrying our son, to volunteering to carry him! The Tula Baby Carrier is a soft structured carrier that allows for plenty of adjustments to be made – ensuring the most comfortable fit for everyone. 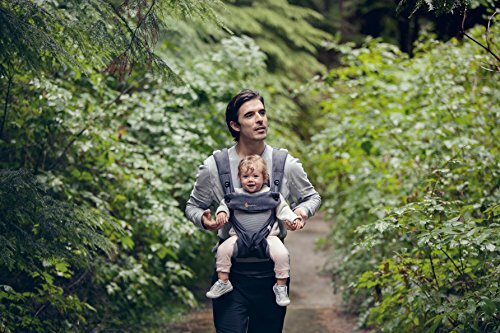 Other aspects that make the Tula SSC the best baby carrier for dads include the large well-padded extendable waist belt and the dual-adjustment straps. Both my husband and I found it to be the most comfortable baby carrier for back carries, which made it much easier to carry him when walking the dogs or doing the vacuuming! This was in part thanks to the quality, thick padding on the shoulders and hips. And children find it super comfortable also, due to the high back support and padding around their thighs. Tula baby carriers are also the most attractive SSC on the market, with a range of fun prints to suit every personality. You can even buy wrap conversion Tula baby carriers, but expect to fork out a lot more than a standard canvas carrier! Lightweight at 1.3 lbs and rolls up small. Handy pocket for keys and money. When it’s hot out, it’s easy to worry about you or your baby overheating when you’re carrying them close. But LÍLLÉbaby’s Complete Airflow carrier provides a safe way to wear your babies in a hot climate. The cotton and mesh construction make for a breathable carrier that maximises airflow. Allowing you and your baby to be more comfortable in hot weather, or while enjoying outdoor activities such as hiking. LÍLLÉbaby Complete Airflow carrier boasts being able to carry your baby in a range of positions, from newborn to toddler. But sometimes it’s better to do a few things well than a lot of things so-so. And this rings true for this LÍLLÉbaby carrier. While it’s a great choice if you have a young baby and your main concern is air circulation, there are better carriers out there for toddlers. But that’s a minor gripe. Most people who buy this carrier rave about it and love the flexibility. Super comfortable carrier for long days exploring. Able to swap between children of different ages easily. The Ergo Baby 360 caused quite a stir when it first came out as it was one of the first front-facing baby carriers that kept your child’s knees and hips in the correct, natural M position. Before this, Ergo baby carriers were already a popular option for their durability and comfort. And the additional benefit of having your baby front-facing added to its appeal. If the celebrity endorsement wasn’t enough to woo you, perhaps the fact it was developed with the help of doctors will. It’s touted as being one of the most comfortable carriers on the market – especially for younger children – due to the thickly padded waistband and shoulder straps. It’s also fully adjustable and allows for front, back and hip carries alongside the front-facing option. This version, with the addition of Cool Air Mesh, also makes it a good option when travelling to hotter climates. Easy to put on & off. Comfortable to wear for long periods, hiking etc. Can carry children of different ages. One carrier for two parents. When my son outgrew his Baby Tula, we upgraded to a Toddler Tula. It was fabulous and at the time, it was one of two toddler-specific carriers on the market. Now, however, there is far more choice available, and the LÍLLÉbaby CarryOn tops the Tula in terms of longevity and price! The LÍLLÉbaby CarryOn carrier carries children up to a whopping 60 lbs – so it’s the ideal carrier if you’re planning on extending your babywearing days! My 5.5-year-old could still comfortably be carried in the Lillebaby, whereas he’s pushing the limits of the Toddler Tula carrier. The Lillebaby can also handle a hip carry and comes in at a lower price point. There’s only one exception, and that’s if you’re a plus size parent, you may want to opt for the Beco Toddler Carrier. The Beco waistband extends up to 59″ compared to LÍLLÉbaby and Tula’s 55″. Two pockets for carrying small extras. Breathable for warm weather holidays. Super comfortable for long days sightseeing/at Disney/hiking. Deuter leads the way when it comes to finding the best baby hiking carrier. This structured carrier is different to the other baby carriers on this list, but for a specialised activity such as hiking, it pays to have the right equipment. 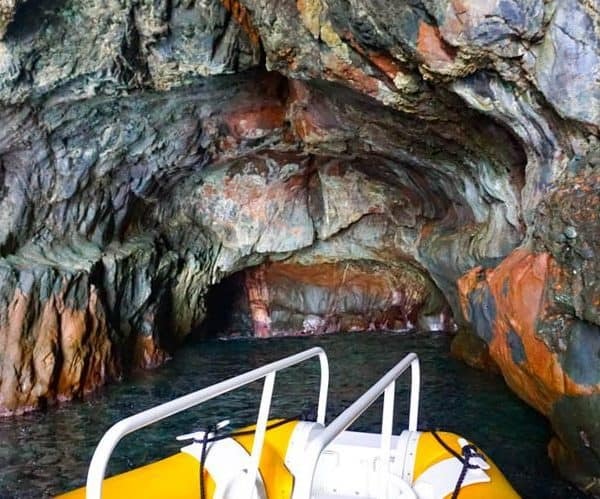 What makes this carrier stand out from the competition are its comfort and safety features. The revolutionary Aircontact Pro Backsytem distributes the weight of the carrier and your child wonderfully, allowing for an extremely comfortable carry, no matter who is wearing it. And your child will be riding in comfort too. The seat height can be adjusted to meet the needs of your baby, and foot stirrups add to the perfect long-distance seating position. A 5-point harness mimics a good car restraint for your child – allowing them to ride in safety – and you don’t have to worry about them moving about in the carrier. There’s even a handy sunshade to keep the little one protected in hot weather! Adjustable fit makes it a great carrier for all parents. 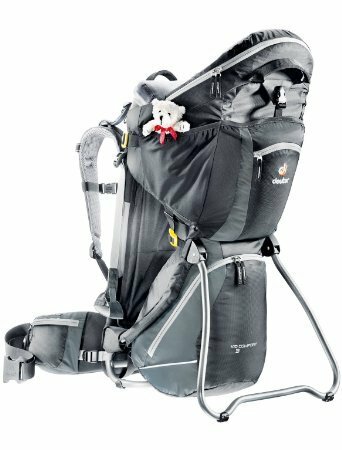 Includes a large cargo pouch under the child’s seat for hiking essentials – removing the need to carry another bag! This is a really good article for every mom & baby. All these carriers are looks wonderful, especially the “LÍLLÉBABY COMPLETE AIRFLOW”. Because it looks very comfortable and beautiful. Thanks for the useful information.